Our first topic was about the changes that happen in company culture once a certain threshold is overstepped. The founders lose touch with their own groundwork and then with their own employees. Compliance frameworks are installed and then enforced, even if the rules make no sense in specific cases. A new hierarchy layer, the middle management, springs into existence and is populated by people that never worked on the topic but make all the decisions. The brightest engineers are promoted to a management position and find themselves helpless and overburdened. Adopting a new technology or tool takes forever now. The whole company stalls technologically. Sounds familiar? We discussed several cases of this dramaturgy and some ways around it. One possible remedy is to never grow big enough. Stay small, stay fast and stay agile. That’s the Schneide way. We devoted a lot of time on getting to know jDeodorant, an eclipse-based code smell detection tool for Java. We grabbed a real project and analyzed it with the tool. Well, this step alone took its time, because the plugin cannot be operated in an intuitive manner. It presents itself as a collection of student thesis work without overarching narrative and a clear disregard of expectation conformity. If several experienced eclipse users cannot figure out how a tool works despite having used similar tools for years, something is afoul. We got past the bad user experience by viewing several screencasts, the most noteworthy being a plain feature demonstration. Once you figure out the handling, the tool helps you to find code smells or refactoring opportunities. In our case, most of the findings were false alarms or overly picky. But in two cases, the tool provided a clear hint on how to make the code better (both being feature envies). If the project would really benefit from the proposed refactorings is subject for discussion. The tool acts like a very assiduous colleague in a code review when every improvement gets rewarded. We really don’t know how to rate this tool. It’s hard to learn and provides little value on first sight, but might be useful on larger legacy code bases. We’ll keep it at the back of our minds. During the discussion about jDeodorant, we talked about naming schemes and other syntax rules. We remembered horrific conventions like prefixed I and E or suffixed Exception. The last one got some curious looks, because it’s still a convention in the Java SDK and some names won’t make it without, like the beloved IOException. But what about the NullPointerException? Wouldn’t NullPointer describe the problem just as good? Kevlin Henney already talked about this and other ineffective coding habits (if you have audio degradation halfway through, try another video of the talk). It’s a good eye-opener to (some of) the habits we’ve adopted without questioning them. But challenging the status quo is a good thing if done in reasonable doses and with a constructive attitude. When we played around with jDeodorant and surfed the code of the project that served as our testing ground, the Infinitest widget raised some questions. So we talked about Continuous Testing, unit tests and some pitfalls if your tests aren’t blazing fast. The eclipse plugin for MoreUnit was mentioned soon. Those two plugins really make a difference in working with tests. Especially the unannounced shortcut Ctrl+J is very helpful. I’ve even blogged about the topic back in 2011. Imagine you’ve developed a software solution for one of your customers, for example a custom CRM. Everything in this system revolves around the concept of a customer as the key entity. Of course, this is reflected in your code as well. The code is crowded with variable and class names like customerThis and CustomerThat. But now your customer wants you to change the term customer to client. Texts displayed in the user interface. If your application is internationalized or at least prepared for internationalization, they are usually neatly contained in translation files and can be easily updated. User documentation like manuals. Don’t forget to update the screenshots. text protocol strings (e.g. JSON keys) and HTTP API routes/parameters. Of course you can only do that if you are allowed to break the protocol! Don’t accidentaly break your API or formats, e.g. if JSON keys or XML tags are generated via reflection from code identifiers. IDE support for renaming can help a lot. Especially the renaming of identifiers is reliable in statically typed languages. However, local variables, function parameters, and fields usually have to be renamed separately. In dynamically typed languages automated renaming of identifiers is often guesswork. Here you must rely on a good test coverage. Even in statically typed languages identifiers can be referenced via strings if reflection is used. If you don’t rename everything all at once, but decide to use the new term only in newly written code and to leave the old term in the existing code until it eventually gets replaced, you will probably end up with a long transition phase and lots of confusion for new project members who don’t know about the history of the project. In the first part I emphasized how important it is to think for the user. Normally I tried to think like the user. The problem is: the users of my software have a totally different view point and experience. They are experts in their respective domain and have years of working knowledge in it. So I try a more naive approach: thinking with a beginner’s mind. Question everything. Get to the whys, the reasons. But how do I translate this information to a software interface? 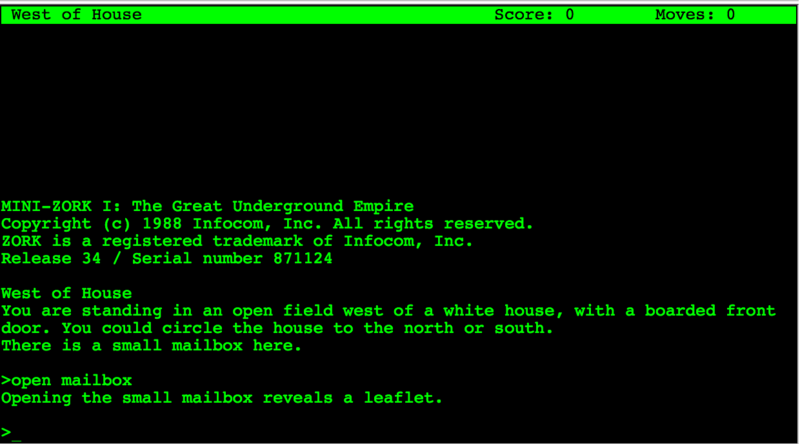 I remember playing (and programming) my first text adventures, later on with simple static images. Many of them had a rich and fascinating atmosphere in spite of having any graphic gizmos or sophisticated real time action. One of the most important parts of your user interface is text and the words need to be carefully chosen from the user’s domain. But here I want to highlight another similarity between a text adventure and thinking for the user. A text adventure presents the user with a short but sufficient description. These small snippets of text is all the information the user needs at this step of his journey. A user interface should be the same. Think about the crucial information the user needs at this step. But the description does not stop here: it highlights important parts which further the story. Think about the necessary information and the most important information. Think about a simple hierarchy of information. For atmosphere and fun the text adventures add small sentences or even unusual phrasing. Besides highlighting things by contrast these parts help the user to get a sense where in the part of the journey he is. Where he came from and where he can go. It connects different rooms. A business process from the user’s domain is like a journey through the software. He needs to know what the next steps are, what is expected and what is already accomplished. Furthermore the actions which can be done are of utmost importance. In text adventures objects which can be interacted with are emphasized by giving them an extra wording or sentence at the end of a paragraph. Actions are revealed by the domain (common wisdom or specific domain knowledge like fantasy). For this we need to determine which actions can be done in this part of the process, on this screen. After listening and reflecting on the information we collected from the user’s view point of their domain, we need to divide it up into steps of a process and form a consistent journey which resembles the imagination of the process the users have in mind. Ryan Singer uses a simple but effective notation for jotting down the needed information and the possible actions. The information forms the base. Without it the user does not know where in the process he is, what process he works on and what are the next steps. In order to extract this information form the vast knowledge we already collected we need to abstract. Imagine you have only the information present in this step and want to reach this goal. Is this possible? Is the information sufficient? What information is lacking? Is the missing information part of the common domain knowledge? Did you verify it is common domain knowledge? And if you have enough information: do you know what the expected actions are? What should be done to get further to the goal? Thinking about every step on the way to the goal helps designing each step. But it is also important to not lose sight of the big picture, the goal. Maybe some steps are not necessary or can be circumvented in special cases. Here you need the knowledge of the domain experts. But remember you need to question the assumptions behind their reasoning. Some steps may be mandated by law, some steps may be needed as a mental help. Do not try to cram everything into one step. The steps and their order need to resemble the mental image of the users. But you can help to remove cruft and maybe even delight them on their journey. But this is part of another post.